Plans covered include Killini, Kalamata, Kiparissia, Pilos, Steno Methonis and Katakolon. Scale: 1 : 190,400. For this 2014 edition the chart has been fully updated throughout. 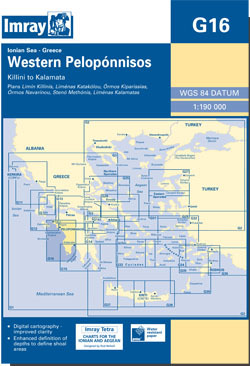 The sketch plan of Stenón Methónis has been replaced with a fully WGS-84 compatible plan, and harbour developments are shown at Killini, Katakólon and Kiparissia.